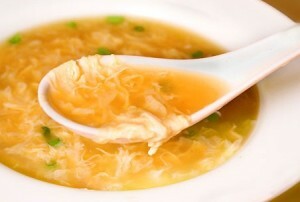 Egg Drop Soup: Egg drop soup is a Chinese soup of wispy beaten eggs in boiled chicken broth. Condiments such as black pepper or white pepper, and finely chopped scallions and tofu are also commonly added. The soup is finished by adding a thin stream of beaten eggs to the boiling broth in the final moments of cooking, creating thin, silken strands or flakes of cooked egg that float in the soup. Mix together the chicken stock at room temperature, cornstarch, ginger and garlic powder in a medium saucepan. Whisk the mixture until combined and no lumps remain. Heat the mixture over high heat until boiling, stirring occasionally. Meanwhile, whisk together the eggs and egg whites in a small measuring bowl. Once the broth reaches a boil, remove from heat. Using a fork or whisk to stir the broth in a circular motion, while slowly pouring the whisked eggs into the soup to create egg ribbons. Stir in the sesame oil until combined. Season the egg drop soup with salt and pepper to taste. Serve the egg drop soup immediately, topped with green onions for garnish.